Julie Gottlieb (Sheffield) ‘Chamberlain’s Umbrella: ‘Object’ Lessons in the History of Appeasement’ and book launch! After the seminar you are also warmly invited to join Julie for the launch of her new book: ‘Guilty Women’, Foreign Policy and Appeasement in Inter-War Britain in Blackwell’s bookshop, Jessop West from 6pm. The history of foreign policy and appeasement has too often been told with the women left out. But were there ‘Guilty Women’ who supported the ‘Guilty Men’ and endorsed British foreign policy? 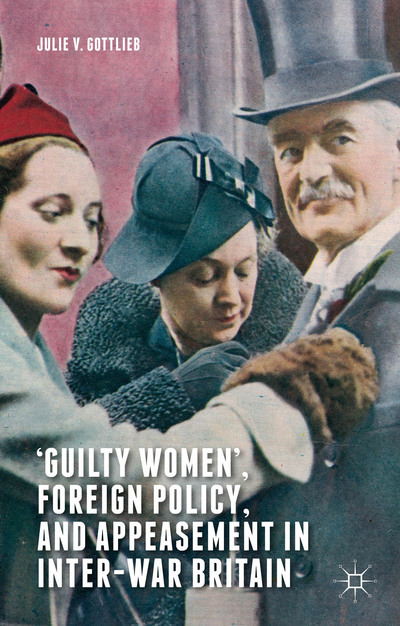 ‘Guilty Women’, Foreign Policy and Appeasement in Inter-War Britain examines the place of gender in the formation, presentation and cultural meaning of British foreign policy in the 1930s. Despite their marginalization from high political office and their formal exclusion from the Diplomatic Service, it breaks new ground by demonstrating that women were present in high-level foreign policy-making circles—such as the Cliveden Set, within the Conservative Party, or as Churchill’s anti-appeasement allies. It considers the range and effectiveness of political responses amongst British women to the threat of fascism in the 1930s; how public and press debates about foreign policy adopted gendered imagery and language; and it argues that female public opinion – both real and imagined – was an important dynamic in electoral politics and discourse during the crisis years. Indeed, women’s feelings and fears of war weighed heavily on PM Neville Chamberlain, ‘the Father of Peace’, during the Munich Crisis, while the whole policy and practice of appeasement came to be understood as an emasculated response to the hyper-virile dictatorships.